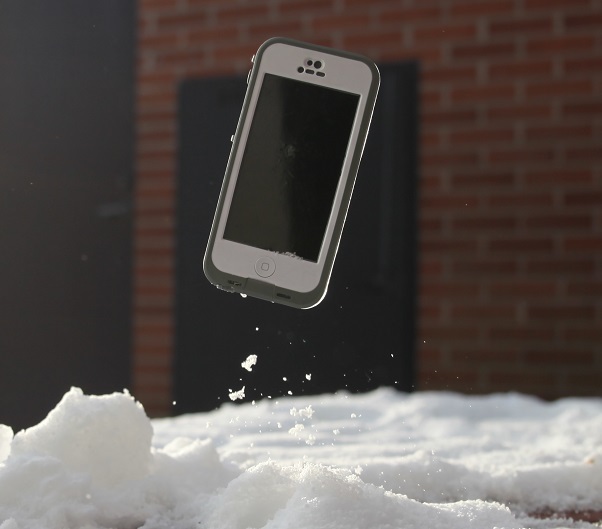 We have written about Lifeproof’s super durable phone cases before. This is the Nüüd case for iPhone 5, the newer version. The difference between this one and the regular Lifeproof case is that there is nothing covering the screen. This makes touch ability a lot better, which was pretty much the only downside before. Now you can use the touchscreen just as well as without a case. This version is also somewhat slimmer and features a headphone jack plug with a tether to it, so you wont loose it. It looks nicer and is noticeably slimmer, however it it just as durable. It also works with iPhone 5s although you can’t use Touch ID. There is however a newer version which does support Touch ID. Accessories like the bike holder we tried naturally work with this version as well. I’ve tried both the black and white version, they both look very good. Just looking at them you couldn’t guess how much abuse they can actually take. You still have full access to all buttons and ports. It feels very good in your hand and the rubber lining makes it hard to drop. I’ve never actually been able to break one of Lifeproof’s cases, so i decided to give this one a really thorough testing. Specifications state that it can handle 2m drops as well as being under water up to 2m. And while not recommended you can exceed these limitations by an almost ridiculous amount. For example i have dropped the phone with the case from a fourth story balcony, thrown it as high up in the air as possible and even slammed it against stone. It has survived drop onto stone, snow, into water. 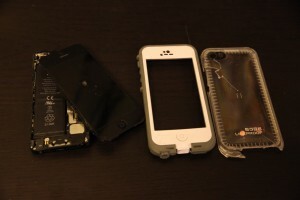 The laws of physics tells me one thing, but this case seemed to be truly indestructible. The worst drop it has experienced was probably when i threw it straight up into the air, higher than the trees so at the very least 20 m, then straight down onto asphalt. This only managed to scratch the rubber a bit.. Here you can see how i slammed it into a wall as hard as i could and a ~2m drop into water. The case did finally break, but i honestly didn’t expect it to. While i was curious to see what the breaking point was, I was very surprised when it happened. The final drop was onto asphalt, but not any harder than it had previously survived. Judging by the damages it seems the case is more sensitive in the back corners where there is no rubber. I am by no means disappointed, this case is still very impressive and has survived some unbelievable things. I sometimes hand my phone to a friend and tell them that if they can break it, it’s theirs, nobody has succeeded until now. And people have previously used hammers, slammed it into concrete and jumped on it. But up until it broke it didn’t have a scratch on it. So essentially, it will handle even the roughest lifestyles with ease, you probably won’t even be able to break it if you try. Also worth mentioning is that since there’s nothing covering the screen you could easily damage the screen if that’s where the impact happens. A screen protector is included, but that only prevents scratches. While at a conference in New York i asked Lifeproof whether you can use other screen protectors together with the case. And It’s not recommended because the case might no longer be fully waterproof, In fact it’s bound to void your warranty if you do. There’s even a warning in the box. 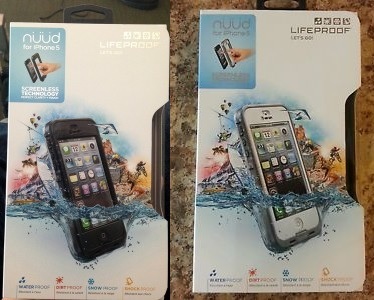 Usually Lifeproof will get you a new case if the one you get doesn’t live up to expectations. From experience i can say that it does work with third party screen protectors, but keep the warranty in mind. If you still want to you can, just make sure the case is still properly assembled. A better alternative if you worry about the screen is the original version which does protect the screen. It costs $89.99, and you can get it here. If you are looking for a durable case there’s simply none other i can recommend. It looks good, feels good and well, have fun trying to break it, it took me several months of trying really hard. 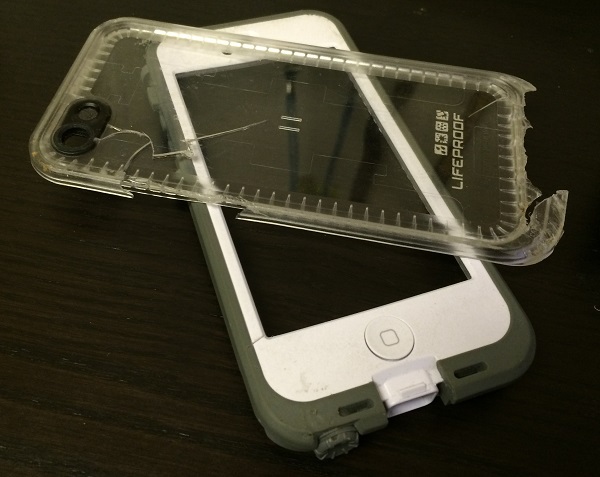 Lifeproofs cases will make you frown upon all other cases. But if the Iphone5-version doesn’t cover the screen with anything, wouldn’t it shatter instantly if one tries to break the case? Well I know that it depends on how the phone lands, but still..
It’s the nüüd version as opposed to the Fre version that doesn’t cover up the screen. As i mentioned the screen is indeed quite vulnerable to hits. As long as it lands on a relatively flat surface the screen is protected by the edges of the case. However that is why i mentioned using 3rd party screen protectors, as there are some screen protectors out there that are completely shatter proof.